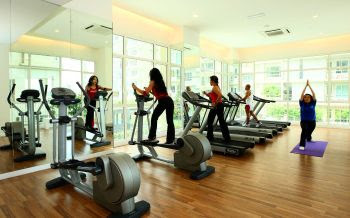 The Kiaraville gymnasium for condo residents, is equipped with high-end Technogym equipment from Italy, an aerobic room with special lighting and sound system. The gymnasium is about 5,000sq ft and even has space for two private training rooms. One of the directors of the property development company, who declined to be named, is a fitness enthusiast who wanted the best facilities available. Residents can make use of the common gym facilities within the operating hours from 7am to 10pm. But the private rooms are meant for residents who prefer the privacy of working out behind closed doors under a private instructor. Professional fitness centre operator Candi Soo has been engaged to run the private rooms which are equipped with its own set of Technoqym equipment. Fees range from RM70 to RM100 per hour. * Marguerita – based on the music and flamboyant movements of carnival-style, contemporary Latin dance For residents with young children, they can leave them at the childcare centre near the gymnasium while they exercise. The centre is designed as a nursery and therapy centr ,in a secure environment. Baby-sitting services have been planned. This nursery, which is only for the use of residents, spans approximately 1,400sq ft and is equipped with facilities under the advice of childcare specialist Jan Deboer. Pool facilities available at Kiaraville include a 32-meter swimming pool as well as a linear pool, children’s wading pool and a pool only for adults. Residents can also relax on German-made Rausch outdoor furniture around the pool deck. Other sports facilities include tennis courts and squash courts, as well as sauna rooms for male and female users. Residents who want to throw parties can make use of the barbecue facilities available. Or they can use the function hall for their own private events. The condo development will also have a convenience store, salon, laundry service and cafeteria. Well-known food and beverage outlets are within walking distance from the nearby Solaris commercial centre which includes the Cold Storage supermarket. Generally, Kiaraville is well connected to other shopping areas such as the Hartamas Shopping Centre, 1Utama mall, The Curve and IKEA as well as the soon-to-be-completed One Mont’ Kiara mall. SYARIKAT Takaful Malaysia Bhd (STMB) aims to capture one-third market share of the government housing loan scheme for the financial year ending June 30 2009. STMB group managing director Hassan Kamil said up to June 30 2008, STMB had collected about RM25 million to RM30 million in premium for the scheme, for a 20 per cent share. Yesterday, the company opened its new Treasury Business Centre to cater for the government employees who took housing loan under the scheme at the Ministry of Finance, Putrajaya. To widen its reach to customers, Hassan said, the company is undertaking an initiative to set up a takaful "desk" within Bank Islam's branches nationwide. STMB will also sell Bank Islam products in all their branches. STMB and Bank Islam are sister companies under BIMB Holdings Bhd. STMB hopes to finalise the consolidation of its branches with those of Bank Islam Malaysia Bhd's by year-end. MALAYSIAN small and medium enterprises (SMEs) should tap into Hong Kong and China's building and construction industry, which is recording one of the world's highest rates of growth, says the Hong Kong Trade Development Council (HKTDC). "Hong Kong serves as an important and convenient entry point into Greater China, minus Taiwan, for Malaysian SMEs in the building industry," said HKTDC assistant executive director Raymond Yip in a statement issued on Tuesday. "In addition, the implementation of the mainland and Hong Kong's Closer Economic Partnership Arrangement (Cepa) will enhance Hong Kong's importance for Malaysians targeting China. "Under Cepa, businesses can gain a foothold in China while Chinese businesses see Hong Kong as a perfect springboard for mainland enterprises to reach out to the global market," Yip said as Hong Kong prepares to host the Third Hong Kong International Building and Decoration Materials and Hardware Fair from October 28 to October 31. Cepa is the first trade agreement concluded by China and Hong Kong, with its main text signed in June 2003 while implementation takes effect from January 2008. Organised by HKTDC and CIEC Exhibition Co (HK) Ltd, the fair will see both Hong Kong International Building Materials & Construction Equipment Fair and equally popular Hong Kong International Hardware & Home Improvement Fair run concurrently. The trade shows have become an effective sourcing platform for both buyers and sellers targeting Hong Kong and China, with both fairs attracting more than 20,000 buyers from 113 countries and regions last year. This year, the merged fair is expected to bring 300 quality exhibitors from around the world.